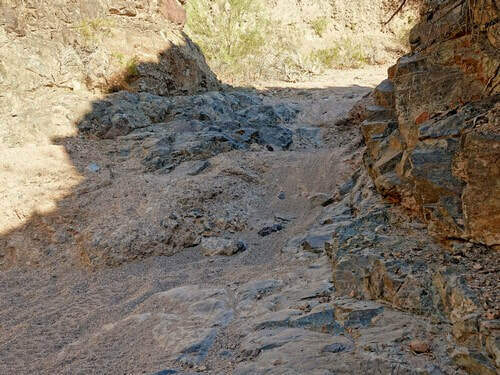 Somewhat difficult Jeep trail near Copper Basin. One major obstacle cannot be bypassed. 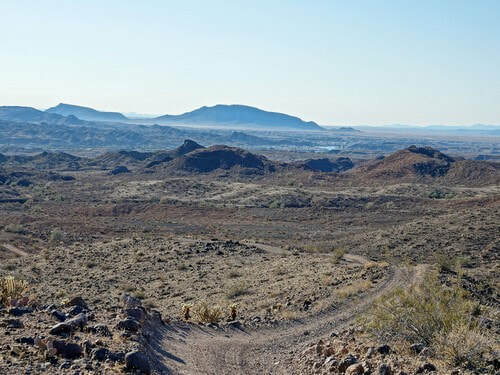 There is nice scenery on this trail, but the major emphasis is on conquering a series of obstacles. 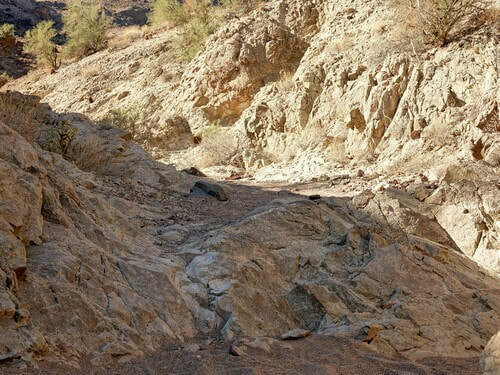 The major obstacle is an undercut ledge with a narrow squeeze around a sharp corner. 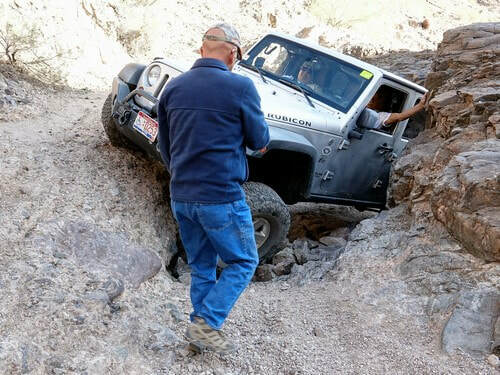 Four door Jeeps have more trouble than two doors Jeeps, but both can do it. 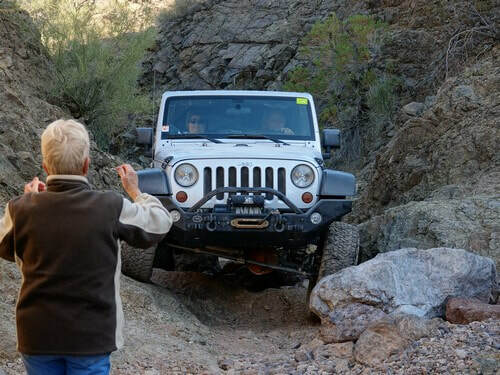 ​​​This photo shows how you must rub your front bumper on the ledge to be wide enough to make the corner. This pushes the limit of a 3.5 rating. 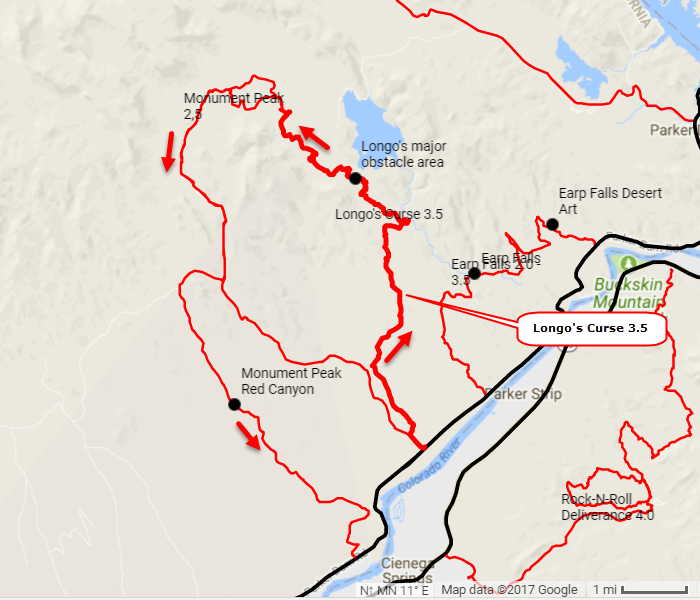 Longo's Curse starts on Parker Dam Road then climbs quickly into Whipple Mountains near Copper Basin Reservoir. John Pritt lived from 1876 to 1931. He was born in Virginia and was buried in a beautiful location in Arizona. We do not know his history. 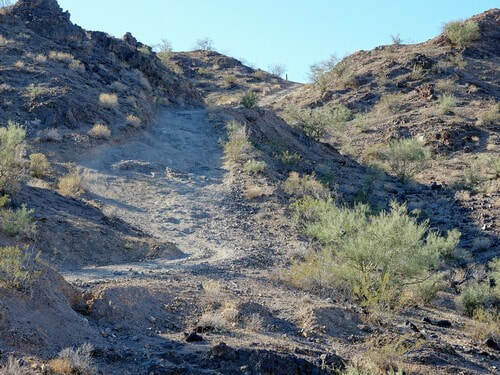 Drop down into an arm of Copper Basin Wash and begin a series of obstacles for the rest of the trail. Some are minor and some are challenging. Do a number of lesser challenges and then come to the major one. See the introductory photo for the correct approach angle. Climb the ledge and circle the wall without tipping into it. A good spotter helps. 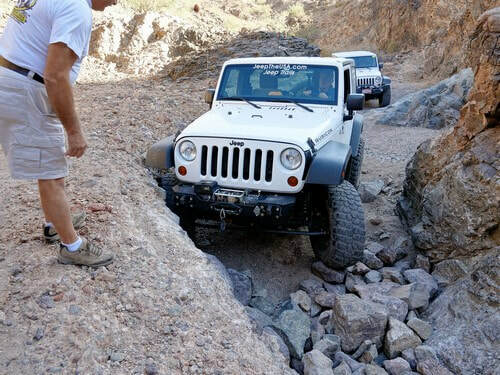 Just kidding about pushing your Jeep. 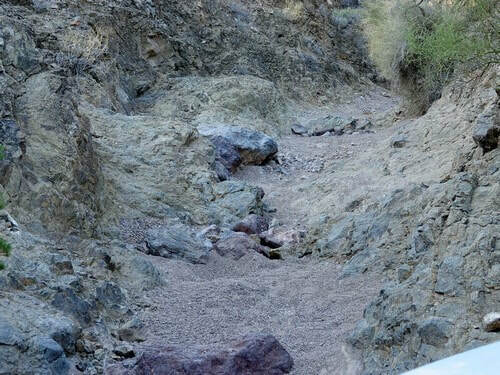 ​Continue up the wash and find a few more interesting spots. 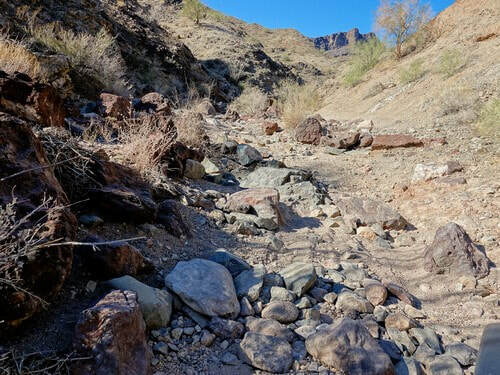 Boulders get washed around every year so the trail is never the same. Come out of the wash and take a short spur to the top of a rise on the right. 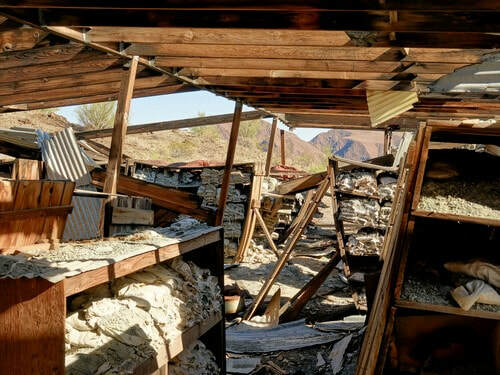 You can see relics from the Copper Basin Mine and also Copper Basin Reservoir. This reservoir is part of Metropolitan Water District. 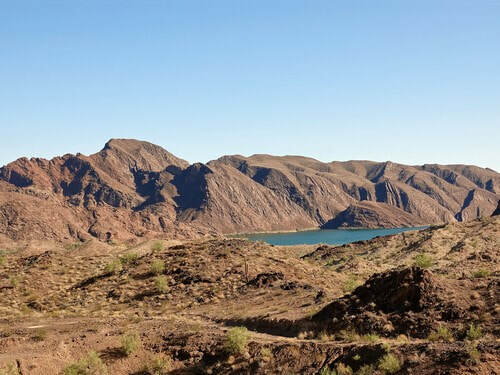 that takes water from Lake Havasu and delivers it to California. 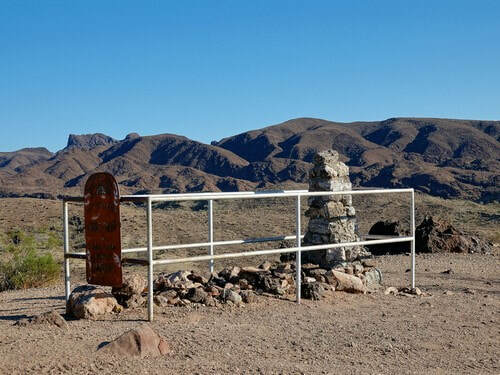 Continue on Monument Peak 2.5 to return to Parker Dam Road. The western leg goes through Red Canyon and is more interesting than the east leg.